With investors worrying about Uncle Sam’s growth and the euro zone’s spotty economic recovery, it’s not hard for New Zealand’s string of positive economic reports to stand out. In the past couple of weeks alone we’ve seen significant upside surprises in the ANZ business confidence, quarterly inflation, trade balance, and most recently New Zealand’s employment numbers. Of course, it doesn’t hurt that China has been popping up better-than-expected PMI reports as well. If you recall, China is one of New Zealand’s largest trading partners. Until we see bearish economic trends for commodities and the comdolls, it’s likely that the strong reports would continue to support the Kiwi. Guess who missed its invitations to the central bank jawboning party! Unlike the BOE, BOC, RBA, BOJ, and other major central banks, the Reserve Bank of New Zealand (RBNZ) hasn’t threatened to release the kraken if its local currency strengthens any further. It’s not that the RBNZ isn’t worried over its impact on exports. Rather, RBNZ Governor Wheeler and his gang believe that the central bank’s limited resources could be put to better use than a straight up currency intervention. Right now the RBNZ is counting on its new home lending restrictions to cool down inflation so it wouldn’t have to raise its interest rates so much. Still, a rate hike is a rate hike, right? Kudos to Big Pippin for pointing out this one! 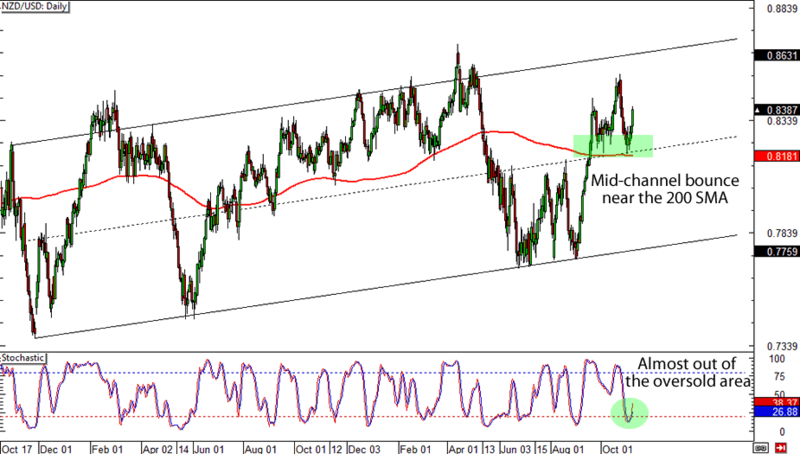 As we can see from NZD/USD’s daily chart, the pair has just bounced from the 200 SMA and a long-term mid-channel support. While the pair has already bounced, you could still grab a couple hundred pips if you think that it will reach the top of the channel. Just make sure that your risk ratios are still at least 1:1! There you have it folks! 3 reasons to buy NZD! I gotta remind you though that there’s no such thing as a sure thing. A market-changing event could always pop up and invalidate even the best trading plans. Make sure that you consider different scenarios when making your trade plans!